Lumbar muscle strains and lumbar ligament sprains are the most common causes for low back pain. Low back pain is the second leading reason for doctor’s office visits and the number one reason for missed time at work. A low back muscle strain occurs when the muscles of the back are abnormally stretched too far. A lumbar sprain occurs when the ligaments are stretched or torn from their attachments. Differentiating a strain from a sprain can be difficult, as both injuries will have similar symptoms. In general, it doesn’t matter what you call the problem because the treatment and prognosis for both back strains and sprains is the same. 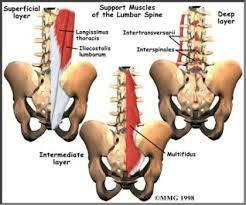 The lumbar spine and its muscles are needed for most all movements and activities. For this reason, the lumbar spine is prone to injury, and when an injury has been sustained, people have difficulty performing many activities. The prognosis is good lumbar strain or sprain injury. More than 90 percent of patients completely recover from an episode of lumbar muscle strain or sprain within 4-6 weeks. However, low back sprain/strain injuries may develop into a chronic condition unless efforts are made to change habits that contribute to the problem. Between 60% and 80% of people will experience low back pain at some point in their lives. A high percentage of people will have low back and leg pain caused by a herniated disk. A disk begins to herniate when its jelly-like nucleus pushes against its outer ring due to wear and tear or a sudden injury. This pressure against the outer ring of the disc may cause localized lower back pain. Once the nucleus breaks, or herniates through the outer ring, pain in the lower back may radiate down the leg and/or foot. This is because the jelly-like material puts physical pressure on these sensitive spinal nerves, causing pain, numbness, or weakness in one or both legs. 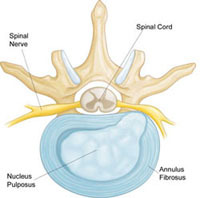 The vast majority of disc herniations will occur toward the bottom of the spine at L4- L5 or L5- S1 levels. 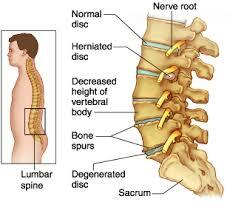 Wear and tear, also called disc degeneration, is the usual cause of a herniated disc. As we age, the discs in our back lose some of the fluid that helps them stay flexible. Those who sit for long periods of time throughout the day, lift heavily at work, or who are obese are statistically more likely to have disc injuries. Sciatica is a relatively common form of low-back pain and leg pain. Sciatica is actually a set of symptoms, not a diagnosis for what is irritating the sciatic nerve and causing the pain. Sciatica describes persistent pain felt along the sciatic nerve pathway. The sciatic nerve is the longest and widest nerve in the body, which runs from the lower back, down through the buttock, and into the lower leg. It controls the muscles of the lower legs and provides sensation to the thighs, legs, and the soles of the feet. Some patients report pins-and-needles sensation, numbness or muscle weakness in the affected leg or foot, or even pain that can worsen after pro-longed sitting, sneezing, coughing, bending, or other sudden movements. One of the most common cause of low back pain in adolescent athletes results from a stress fracture that usually affects the fifth lumbar vertebra in the lower back and, much less commonly, the fourth lumbar vertebra. Technically, this condition is called spondylolysis when the stress fracture is present without slippage of the vertebrae. If the stress fracture weakens the bone so much that it is unable to maintain its proper position, the vertebra can start to shift out of place and typically slides forward and compresses the nerve and spinal cord. This condition is called spondylolisthesis. If too much slippage occurs, the bones may begin to press on nerves and surgery may be necessary to correct the condition. The pars interarticularis is a portion of the lumbar spine. It joins together the upper and lower zygapophysial joints of the lumbar vertebra, also called the facet joints. The pars is normal in the vast majority of children. There may be a hereditary aspect to spondylolysis called congenital anomanlies where an individual may be born with thin vertebral bone and therefore may be vulnerable to this “pars defect” condition. Significant periods of rapid growth, excessive extension motions, repetitive twisting motions may also encourage slippage. Spondylolysis and spondylolisthesis can be present without any obvious symptoms. Degenerative disc disease isn’t really a disease, but a term used to describe the process of changes in your spinal discs as you age. The lumbar disc is a unique and well-designed structure that is strong enough to resist terrific forces, yet it is still very mobile, allowing us to flex, bend, and twist. The disc itself does not have a blood supply, so if it sustains an injury it cannot repair itself the way other tissues in the body can. An otherwise insignificant injury to the disc can start a degenerative cascade whereby the disc wears out. Despite its rather dramatic label, degenerative disc disease (DDD) is fairly common, and it is estimated that at least 30% of people aged 30-50 years old will have some degree of disc space degeneration. Spinal stenosis most often occurs in adults over 60 years old. Your spine is made up of small bones, called vertebrae, which are stacked on top of one another. Spinal stenosis occurs when the space around the spinal cord narrows. This puts pressure on the spinal cord and the spinal nerve roots, and may cause pain, numbness, or weakness in the legs. Arthritis is the most common cause of spinal stenosis. In the spine, arthritis can result as the disk degenerates and loses water content. Over time, this bone overgrowth-called spurs-may narrow the space for the nerves to pass through. 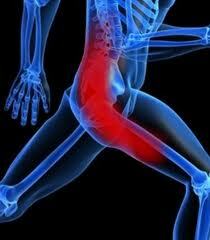 Another response to arthritis in the lower back is that ligaments around the joints increase in size. This also lessens space for the nerves. Once the space has become small enough to irritate spinal nerves, painful symptoms result.